MCI delivers 2 D4505s to Miss. Motor Coach Industries (MCI), a subsidiary of New Flyer Industries Inc., announced the delivery of two MCI D4505 motor coaches to Delta Bus Lines of Greenville, Miss. 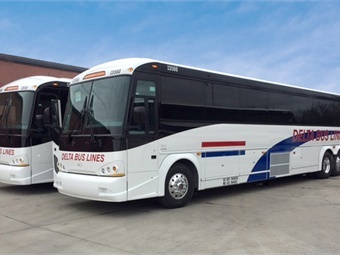 With North America’s best-selling motorcoach, Delta has peace of mind with its fleet of 11 D4505s. The newest two D4505s deliver the reliability and comfort that customers expect since Delta debuted its first D4505 in 2008. The D4505 delivers value-oriented, high quality performance with many of the improvements of the MCI J4500, including dual 150-amp Denso alternators, new parcel racks that expand capacity and the REI A/V system. The model also gained new 90-mm headlights, including an LED headlight option. Delta also installed an interior camera system for driver and passenger security. As a workhorse coach, the D4505 fits nicely into Delta’s daily, year-round roundtrip service between Memphis, Tenn. and Greenville, Miss. ; Greenville and Baton Rouge, La. ; and Greenville and Jackson, Miss. Delta also makes 21 stops in 17 cities, throughout seven of the Mississippi Delta’s 16 counties. When necessary, Delta partners with local transit systems, to serve all constituents, including senior citizens, disabled residents and college students.